Composed by Franz Joseph Haydn (1732-1809). This edition: replaces UT050028. Full score (study). With Standard notation. 222 pages. Wiener Urtext/Vienna Urtext #UT50258. Published by Wiener Urtext/Vienna Urtext (PR.UT050258). When Christa Landon presented the first printed version of her edition of Joseph Haydn's piano sonatas, Haydn's sonata oeuvre was still overshadowed by the works of Mozart and Beethoven. 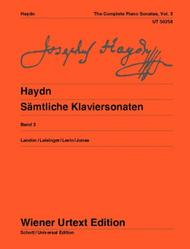 Since then, Haydn's sonatas have progressed from lesson rooms to concert halls, and Landon's edition has played a crucial role in that process. 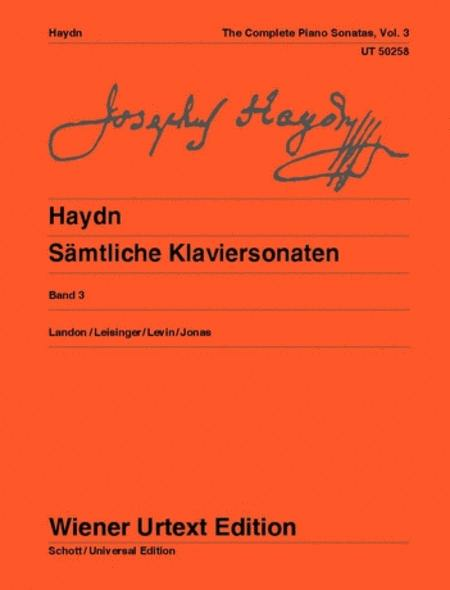 Since the Haydn anniversary in 2009, this legendary edition has been thoroughly revised, taking into account new sources, the resolution of questions of authenticity, and the fact that editorial principles for 18th century music have changed in the past 40 years. The new edition is published in four volumes, the content of each volume being compatible with the volumes of the previous edition. Volume 3 of the new edition comprises the 17 sonatas Hob. XVI:21-32 and Hob. XVI:35-39 contained in Vol. 2 of the previous Wiener Urtext edition, including popular works for music lessons such as Hob. XVI:27, 35 and 37. In the Notes on Interpretation, Robert D. Levin explains important aspects of Haydn's performance practice and, with the help of numerous examples, shows possibilities to embellish the pauses frequently used by Haydn.